* If you prefer, you can see a .pdf version here (2.24 Mb). As I sit down to write this update, I am bundled up in front of the kerosene heater. In Japan, it is common for houses to have no insulation. This means that it is often just as cold inside the house as it is outside. This morning when we woke up, our inside thermometer said it was a chilly 39 degrees! Needless to say, we can't wait for Spring! Well, once again it is time for a quick update on the ministry here in Osaka/Nara. In our last prayer letter we asked you to please pray for the name of the church. Since moving from Sakai City, we thought that calling ourselves Sakai International Bible Church (SIBC) seemed a bit odd. Well, after 6 months of seeking the Lord, SIBC has a new name: we are now officially called Oasis Church. Even before the Lord lead us to the new name, He directed us to John 7:37. In this verse, Jesus says, "If anyone is thirsty, let Him come to me and drink." We felt like the Lord wanted us to be a place where spiritually thirsty people could come and encounter Jesus (i.e. "drink" from Him) through worship, prayer, Bible study and fellowship. Thus, the name Oasis Church seemed like a perfect fit. In a dry and barren nation like Japan, we desire to be a spiritual oasis where people find rest, renewal and refreshment for their thirsty souls. PLEASE PRAY that this new name would be a constant reminder of the purpose and plan that God has for our church family. Overall, things are going well at the church. People are not only beginning to adjust to our new style of gathering together but they are actually beginning to thrive. Most of all, it seems that people are learning how to let Jesus be the actual Head of the church. We saw a good example of this at one of our Sunday gatherings in mid-February. During the course of the previous week, Jesus had spoken to a number of different people in the church about the future direction of Oasis. As we began telling our stories on Sunday morning, we were amazed to discover that we had all heard the same thing! This was proof to us that if we really look to the Lord, then He will indeed be our Good Shepherd. PLEASE PRAY that the Lord would continue to lead and guide Oasis Church as we desire to grow, make disciples and impact Japan for the Kingdom of God. Finally, we want to share a little bit about Mr. K. He is the husband of a long-time member of the church, and has recently been attending on Sunday mornings. He is not a Christian, but his heart is very open. He joins in the singing, participates in the small group Bible study time and even prays out loud for others. Often, when the church takes time to pray for him (he has cancer), he tells of experiencing the power, presence and love of Jesus. He is very close to putting his faith in Christ, so PLEASE PRAY for Mr. K's salvation. May his doubts and questions be replaced by genuine faith in Jesus. May he also experience the forgiveness of his sins, and the joy and peace that comes from walking in friendship with God. PLEASE ALSO PRAY for his physical healing. He has been battling cancer for many years, and just recently we have seen signs of improvement. Let's pray for a miracle as we ask God for complete healing! 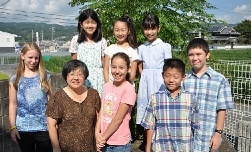 January marked the end of the first semester for Chris as she continues to teach the 5th-6th Grade Bible class at KCS. Although this class is part of the school's curriculum (with tests, homework, etc…), Chris wants the class to be more than just an academic subject. PLEASE PRAY that Chris would be able to impact the student's hearts as well as their minds. For those students who are already Christians, may the class help them to grow in their relationship with Jesus. And for those do not yet know Christ, may their study of the Bible (the written Word) lead them to encounter Jesus (the Living Word). We would also like you to pray for the staffing needs at KCS for the 2013-2014 school year. They are currently in need of a teacher at the high school level as well as someone to serve as school principal. PLEASE PRAY that the Lord would provide qualified, Christian teachers to fill these positions as soon as possible. Of course, if any of you are interested in coming to Japan to minister in such a capacity, please feel free to contact us. We are planning to be in the States this summer for 2+ months of home ministry. This trip is long overdue since we were unable to return last summer due to the moving of the church. Our current plan is to be in the Los Angeles area between mid-June and late August. The Lord has already provided us with a place to stay (thank you Jesus!) but we are still in need of a car to drive during our stay. PLEASE PRAY that the Lord would provide for us in this way. PLEASE ALSO PRAY for the necessary finances to make the trip home. Airline ticket prices have almost doubled since we last went on home assignment, so please pray that we could get our tickets at a very reasonable price. Finally, PLEASE PRAY for our schedule. We are planning to attend Mount Hermon in early July where we hope to connect with many of our individual supporters. On top of that, we want to try and visit with as many of our supporting churches as possible. In past years, we have only had enough time to visit half of our supporting churches while on home ministry. However, because it has been 3 years since we were last in the States and 5 years since we have visited some of our churches, we would really like to try and visit ALL of our churches this summer. Please pray for all of the details to come together. Thank you. Well, that is about all for now. Thank you for all of your prayers, support, e-mails and Christmas cards over these last few months. 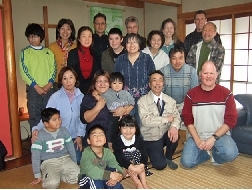 We so appreciate the many ways that people are partnering with us as we desire to serve Jesus in Japan.